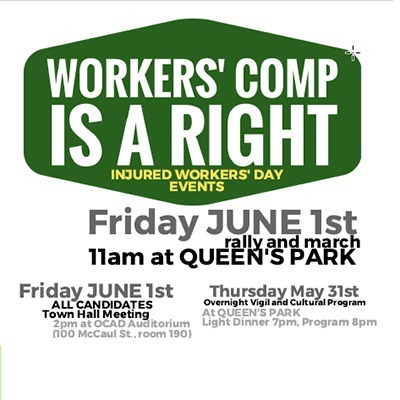 Once again the Ontario Public Service Employees Union (OPSEU) is proud to stand in solidarity with injured workers, the Ontario Network of Injured Workers (ONIWG), other Unions, and the general public as we join the fight for justice on June 1st to mark Injured Worker Day. Activities at Queens Park begin the evening before with a light dinner at 7pm, a cultural program at 8 and an overnight vigil. Events on June 1st kick off with an 11 a.m. rally on the lawn at Queens Park. The event moves on with a march and public demonstration in front of the Ministry of Labour offices on University Ave. An All Candidates Town Hall Meeting follows at 2:00 PM at the OCAD Auditorium 100 McCaul St. Injured Workers Day is a day that we gather together across our communities to pay tribute to injured workers and their families. We join with those injured workers and families to remind careless politicians and thoughtless employers that injured workers exist. They have value. They remain members of our home communities who are human and therefore worthy of both dignity and respect. No one goes to work with the idea of being injured, or permanently disabled. Yet the incidence of workplace injury remains alarmingly high. Throughout the year, but especially on June 1st, our OPSEU membership joins with ONIWG, to demand that our workers compensation system serves the workers it was designed to serve and not act as cheap insurance for derelict employers. It is time our compensation system returns to its roots and fulfills its mandate of providing justice to injured workers. By gathering together we lend strength to our many voices, reminding politicians and employers alike that injured workers number in the thousands. Unfortunately their ranks continue to grow daily. Therefore the need for meaningful, enforceable health and safety laws remains. The current system of “deeming” injured workers fit for a job and then slashing their compensation benefits, by the imaginary wage this phantom job is thought to provide. The use of in house WSIB health care professionals’ diagnoses rather than relying on the injured workers treating physician, who is the heath care provider that actually provides first-hand care to the injured worker. The practice of denying benefits to injured workers based on pre-existing conditions. The ongoing plan to eliminate WSIB’s accrued liability by slashing or denying injured workers benefits is forcing workers and their families into poverty and onto public assistance. Workers and their families who are already struggling with debilitating injuries should not also be forced to engage in lengthy, often years long battles with the WSIB system to gain the benefits they so justly deserve. Employers must be held responsible for workplace injuries. Employers legally hold the ultimate responsibility for workplace safety. Employers need to know that existing workplace health and safety laws will be enforced, and that employers will go to jail, not merely pay a token fine should their employee sustain injury due to employer negligence. Injured workers should not just be a news story buried in the back pages of the local paper. Especially now as unions are under attack and the ranks of non-union and the precarious workforce is growing. The fight for injured worker justice is indeed more pressing than ever.